Climate Change presents a major challenge for development and poverty eradication. There is a relation between poverty in low-income countries and economies heavy dependent on weather-sensitive resources, such as agriculture. Millions of poor people in developing countries are vulnerable to extreme weather events and climate change impacts on ecosystems, water and agriculture. This report looks at nineteen countries and their Poverty Reduction Strategy Papers (PRSP) and National Adaptation Programmes of Action (NAPA) by assessing criteria such as: a) the consideration of climate change scenarios and the vulnerabilities of the country; b) the analysis of poverty-climate links; and c) the climate change institutional framework of the country. It is important to acknowledge that the assessment does not provide a quantitative assessment. It assesses the integration of adaptation to climate change and climate risks management within a subjective qualitative framework. The results show that most countries have a low incorporation of adaptation to climate change into PRSP. But, that by incorporating NAPAs a better performance is shown. The best practices study cases present: Bangladesh successful approach to mainstream natural disaster management, which facilitated the evolution to incorporate climate change into PRSP. MexicoвЂ™s Interministerial Climate Change Commission is presented as a good example of crosssectoral institutional integration. 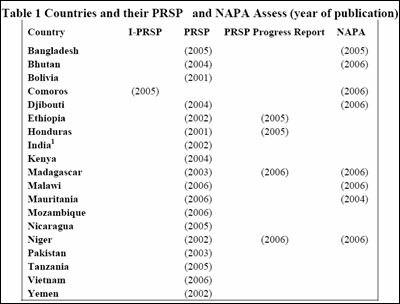 The paper illustrates that natural hazards mainstreaming into PRSP and the development of NAPAs are a step forward into the establishment of an institutional process to incorporate climate change into national policies. The World Bank and the UNFCCC should coordinate efforts to support developing countries in their efforts to incorporate adaptation to climate change in PRSP. Countries need to strength the coordination, networks and information flows between ministries, different levels of government and civil society to have a more efficient integration of climate change variables into poverty reduction and development strategies. The objective of this report is to assess nineteen countries and their PRSPs and NAPAs, if available, by assessing criteria such as: a) the consideration of climate change scenarios and the vulnerabilities of the country; b) the analysis of poverty-climate links; and c) the climate change institutional framework of the country. The assessment provides an overview of the integration of adaptation to climate change and climate risks management within a subjective qualitative framework. The report asks if by incorporating NAPAs a better country performance is shown. The section of best practices study cases has the objective to show that a cross-sectoral institutional integration is a step forward to mainstream climate change into national policies. The report aims to find links between climate change and poverty reduction strategies and to provide recommendations to enhance the coordination of these agendas. There are about 70 low-income countries involved at a certain stage of the PRSP process, which is a requirement for receiving debt relief under the enhanced Heavily Indebted Poor Countries (HIPC) Initiative and concessional assistance from the World Bank and International Monetary Fund (IMF) (World Bank 2007). Research indicates that over the past three decades more disaster prone, low-income countries that are based on simple economies have experienced a much slower pace of economic development than their less disaster-prone counterparts (World Bank 2006). The Intergovernmental Panel on Climate Change (IPCC) indicates that is very likely that hot extremes, heat waves, and heavy precipitation events will continue to become more frequent (Working Group I of the IPCC 2007). The world is already likely to fall short of the Millennium Development Goals for 2015 in many countries. Climate Change threatens the long-term sustainability of development progress. In particular those communities who are already living at or close to the margins of survival will experience a disproportionately harmful effect (Stern 2006). There is a relation between poor communities and economies heavy dependent on weather-sensitive resources, such as agriculture, in low-income countries. Climate change will expose millions of vulnerable poor people in developing countries to more frequent extreme weather events and climate change impacts on ecosystems, water and agriculture. At the national level, PRSPs can act as a key instrument to link poverty and climate change agendas. PRSPs provide a framework for domestic policies and programs, as well as for foreign assistance, with the overall aim of reducing poverty. PRSPs are written by the countries and are comprehensive and result-oriented documents (Bojo 2004). This report assesses seventeen full PRSPs, four PRSPs Progress Reports, one Interim Report, one national development plan (for the case of India) and eight NAPAs. Table 1 presents the selected countries, their documentation, and year of publication for the assessment. The selection considered first the full PRSP, if available, and / or its latest document related to their stage on the PRSP process. The NAPA is introduced into the assessment to identify if there is a clear National Institutional Framework that considers climate change into national policies and if NAPA, as a process, influences the incorporation of climate change into the PRSP process. The Sub-Saharan region is represented by nine countries; the Middle East & North of Africa by two countries; South Asia by four countries; East-Asia by one Country; and Latin America & the Caribbean by three countries. The next section вЂњMethods of AssessmentвЂќ shows the rationale behind the criteria selected, the boundaries of the research and defines the scoring system. It is followed by a section describing results of the assessment. A section with study cases shows a deeper analysis of the Bangladesh PRSP and climate change. And a description of Mexico's institutional framework to climate change. The final section gives conclusions and recommendations.